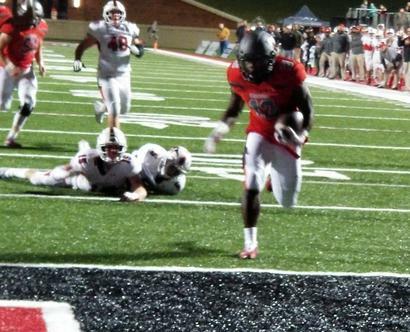 #13 RB Shadrick Byrd with one of his three touchdowns vs Hewitt-Trussville Friday night. Thompson (8-1, 6-1) running back Shadrick Byrd rushed for 207 yards on 29 carries with three touchdowns and the Warriors had 649 total yards in the victory. "I was really proud of the way our kids responded," said Warriors head coach Mark Freeman. "This game got crazy early, but our kids just kept battling. I think it was a great game on our part. Scoring big before halftime was huge because we knew we were getting the ball back to start the third quarter. By scoring, we could run the football still and get back into the game. The day to day travel and working out together is we don't loose confidence in each other. Our defense turned around in the second half and got us back into the ballgame." Hewitt-Trussville (7-3, 5-2) started the scoring in the game and it happened on the first drive of the game for the Huskies. With 9:50 left in the first quarter Paul Tyson to Ja'Varrius Johnson on a 7-yard touchdown pass. The Huskies led 7-0 early. With Thompson driving deep into Huskies territory and on a fourth down call, the Thompson receiver made the necessary yardage, but after review Thompson came up short and turned the ball over to Thompson. A few Huskies plays later, Tyson ran it into the end zone for a 2-yard score and Hewitt-Trussville led 14-0 with 5:42 left in the game. After Thompson taking their possession and driving deep into Huskies territory for the second time, Hewitt-Trussville linebacker Brayden Burguson picked off a Warriors pass and the Huskies offense was back in business and it didn't take them long to score. With 1:10 left in the first quarter, Armoni Goodwin scored on a 12-yard touchdown run to put Hewitt-Trussville up 21-0 late in the first quarter. Goodwin rushed for 193 yards on 25 carries and the touchdown. With another defensive stand by the Huskies, Hewitt-Trussville took over the football and with 9:45 left in the second quarter, Tyson hit Johnson on a huge 52-yard touchdown play and the Huskies led big 28-0. Johnson finshed the night with nine receptions for 227 yards and two touchdowns. Even though Hewitt-Trussville was up big, Thompson outscored them 63-21 the rest of the game. With 4:45 left in the second quarter, Thompson scored on a Taulia Tagovailoa 47-yard touchdown run and the Huskies lead was cut to 28-7. With the Huskies going three and out, Thompson scored again with 4:02 left in the half as Tagovailoa to JB Mitchell on a 27-yard touchdown in the right side of the end zone and the Warriors were marching back into the game trailing 28-14. Hewitt-Trussville changed the momentum quickly as Johnson scored on a big 99-yard kickoff return for a touchdown and the Huskies led 35-14 late in the half. Thompson though came right back before the half and scored on a Tagovailoa 19-yard touchdown run. The Warriors went 80 yards on eight plays to score right before the half and cut the Huskies lead to 35-21. A few plays later, Hewitt-Trussville gave themselves a long field goal opportunity but the kick sailed left and the Huskies led 35-21 at halftime. "We had positive vibes in the locker room at halftime," said Warriors QB Tagovailoa. "Coach Freeman came in and gave us a few adjustments but had all the confidence in us that we could go back and turn the game around. All of our leaders stepped up and it was all positive." WIth 7:55 left in the third quarter, Byrd scored on a 18-yard touchdown run to cut the Huskies lead to only seven points. With :53 seconds left in the third quarter, Thompson tied the game at 35 on a Jarrett Crockett 8-yard touchdown run. WIth 8:05 left in the fourth quarter, Thompson took the lead on a Bryd 2-yard touchdown run and the Warriors led 42-35. Hewitt-Trussville responded back with a touchdown and with 6:05 left in the game, a Tyson to Dazalin Worsham 1-yard touchdown pass brought the two teams tied again at 42 all. Tyson finished the night completing 15-of-24 passing for 270 yards with three touchdowns and the one interception. Thompson raced right back as Byrd scored on a 42-yard touchdown run and with 5:10 left in the game, the Warriors took a 49-42 lead. Again, Hewitt-Trussville responded on a Sean Jackson 17-yard touchdown run and the game was tied at 49. With 1:40 left in the game, the winning touchdown was made on a Tagovailoa to Mike Pettway on a 59-yard touchdown play for the Warriors and Thompson led 56-49. The Warriors defense made a stand when they had to as DJ Douglas picked off a Huskies pass with 1:12 left in the game. With:52 seconds left in the game, Crockett scored on a 1-yard touchdown run to seal the win for the Warriors. Thompson quarterback Tagovailoa was been giving more of the green light to run the football. "I've had to put a bug in coaches ear about running a little more late in the season. Coach told me I don't know but I keep at him about it," added Tagovailoa. "He knows the right time for me to run the ball. We have been working on my speed. My brother (Tua Tagovaloa) has told me that I am slow so I've had to put in the work to get faster. Tua probably beat me in the 40-yard dash." Up next for both teams, Hewitt-Trussville is done for the regular season and will play at James Clemens in the first round of the playoffs while Thompson will travel to Crestview, Florida to close out the regular season and play Florence in the first round of the 2018 playoffs.